In this lesson we will be studying Mark Chapter 6. To help us understand the various locations referenced in this chapter and elsewhere, I am including a pertinent relief map found on the internet. It is useful because it clearly shows us the locations mentioned relative to Jesus’ activities and travels. You will note that the body of water in the center is called the "Lake of Gennesaret." This is one of four names given to the Sea of Galilee; the other two are "Lake Kinneret" and "Lake Tiberias." I have also included (after the Questions section below) three photos that I took at Machaerus, the location cited by the Jewish historian Josephus as the site where John The Baptist was beheaded. We’ll have more on that later. Mark Chapter 6 opens with Jesus once again traveling around the coastal areas of the Sea of Galilee. Having raised the girl from the dead in Capernaum, he leaves and travels up into the mountains then southwest approximately twenty miles to his hometown, Nazareth (not pictured on this map). His disciples follow him; and, as was his practice, in Capernaum he goes into the synagogue in Nazareth to teach. Let’s read through Chapter 6 and consider the following questions. ANSWER: The men of Nazareth see and hear many things when Jesus returns to his home village. They are astonished at his wisdom and at the miracles he is doing. ANSWER 1: Instead of seeing him as the Messiah, they looked down at him. All they saw was "a carpenter’s son"—they completely ignored all of his wisdom, teaching, and miracles. They dismissed his teachings because they knew his parents; and believed that he came from lowly, humble roots, and thus not worthy of serious consideration. ANSWER 2: The great lesson here for us is that we should not judge God’s message or his messengers based on external appearances, or based on man’s worldly-based wisdom. ANSWER 1: We can see from Mark 6:3 that Jesus had four brothers and at least two sisters, as the original word for sister is plural. We do not know exactly how many sisters he had; he could have had several. All were apparently living in Nazareth at the time of his visit. ANSWER 2: This means that, while Jesus is the only son of God, he was raised in a family of six to eight (or nine) children. He experienced life as a child with other siblings, so he truly can identify with us in all aspects in life—even growing up with younger brothers and sisters. ANSWER 3: Note that the Bible never refers to Jesus’ brothers and sisters as "step-" or "half-" siblings. ANSWER 2: His "own relatives." ANSWER 3: His "own household." ANSWER 1: Other than a few healings, Jesus did no miracles in Nazareth. ANSWER 2: The scripture tells us that Jesus could do no miracles there due to their unbelief. If we reject Jesus, he will reject us and move on. The local Nazarenes rejected him, so Jesus left Nazareth, never to return. Following Jesus’ departure from Nazareth, he gives the disciples their first real task or mission. His instructions, and their actions, are covered in two areas of the chapter, Mark 6:7-17 and Mark 6:30-32. How do we know he gave these instructions to just the twelve Apostles, and not all of the disciples following him? ANSWER: Verse 7 specifically mentions them as "the twelve." Jesus knew how the twelve would be received, and he gave them instructions based on this. We can see that there were likely one of two outcomes. What were they, and how do we know this? ANSWER 1: The Apostles were to take nothing with them. Jesus would make sure that they were provided for. In verse 10, he also indicates that they would enter homes of people who would put them up and care for them. So we know that one possible outcome was that the twelve would be welcomed by someone. ANSWER 2: We also know from verse 11 that not everyone would welcome them. Jesus’ instructions to us today are just as true as they were then. When we present the Gospel, we do not need anything, just the Holy Spirit. And, similarly, one of two results are likely: we will either be well-received or rejected. Can you find out why Christ told them that when they were not well-received to "shake the dust off the soles of your feet as a testimony against them?" ANSWER: The Jews had a custom that when they left a Gentile area, they would shake the dust off the soles of their feet as a way of separating themselves from the pagan Gentiles. In this way, the twelve would be showing those Jews they visited, who did not listen to them, that they had rejected the Gospel and were acting like pagans. Thus the twelve were separating themselves from those people. This custom would have been clearly understood by the Jews of that time. ANSWER: They think that Elijah or John The Baptist have risen from the dead; or that Jesus is himself a prophet. This is the only way they can explain all of the miracles. What does Herod think about all of this, and why? ANSWER: He believes that John The Baptist has risen from the dead. Herod’s guilty conscience gets the best of him. ANSWER: Herod had John the Baptist arrested to please Herodias; but he was nevertheless afraid of him, because he knew that John lived a righteous life. We now move south from the Sea of Galilee to the northeast corner of the Dead Sea (on what today would be the Jordan side of the Dead Sea) to a place called Machaerus, the remnants of which are shown in the pictures below at the end of the questions portion of he lesson. Built to serve as a fortress, it also served as a seaside retreat for Herod. It was here, according to Josephus, that John was imprisoned in a cave and eventually beheaded. In the pictures, you can see the cave-prisons built into the side of the hill, as well as the remains of the courtyard where Salome would have danced for Herod and his guests while John was imprisoned just below them. John remained there in prison for two years. Why that long? What does the text tell us about Herod and John’s relationship during this time, and what specifically led to John’s beheading? ANSWER 1: Herod was fascinated with John. He actually liked listening to him; and keeping John in prison kept John safe from Herodias and thus kept her happy (at least for the moment). ANSWER 2: However, the day comes when Herodias uses her daughter to get her way. Following a great dance in front of Herod and his guests, Salome is granted any wish she desires; and her mother Herodias tells her to ask for John’s head. All of this was played out before Jesus and his disciples went to Nazareth, but the guilt of killing John the Baptist was evidently still on Herod’s mind. ANSWER 1: Jesus feeds the entire crowd using only prayer, five loaves of bread, and two fish. ANSWER 2: It was clearly a surprise to the disciples. Even after seeing all of Jesus’ previous miracles, and seeing many miracles during the two-by-two mission journey that Jesus had sent them on, none of them expected this. The disciples’ reaction to urgent need to feed the five thousand is typical of our reaction when challenging times come upon us. Even though we have seen or read about miracle-after-miracle, we still don’t think that Jesus is capable of handling our current challenges. More importantly, the disciples were thinking like man, and not like Jesus. They could not comprehend that Jesus could feed all of those people without going out and buying supplies. How many times have we been in the same situation? Rather than thinking and seeing God-sized visions and God-sized miracles, we restrict our thinking to limited human-sized solutions. There are no limits with God. Read Mark 6:45-52. Here again, Jesus does the unexpected, demonstrating his power and authority over everything on the earth. Having witnessed all of these miracles in a single day, what do these verses indicate regarding the disciples’ thinking at the end of this passage? ANSWER: In spite of all that they had seen, the disciples still did not understand how the miracle of the loaves and fishes was accomplished (see Mark 6:52). The text tells us that "their hearts were hardened." Amazing. 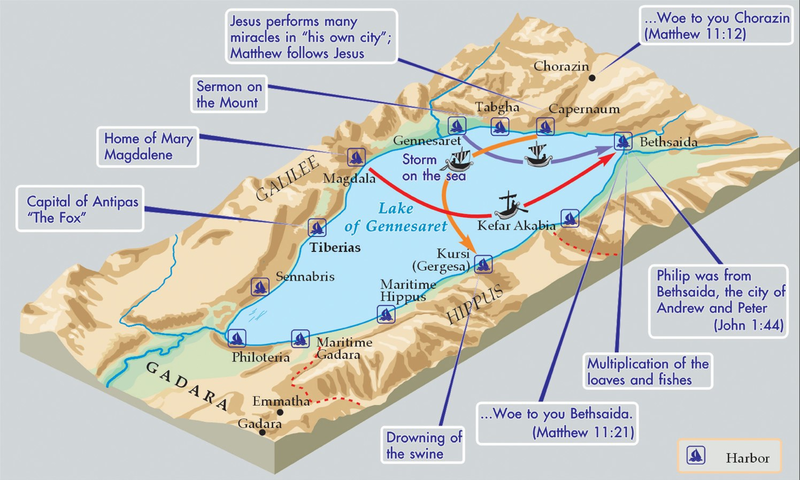 At the end of the chapter, the boat with Jesus and his disciples has crossed back over the Sea of Galilee once again, this time arriving on the shore at Gennesaret (located on the northwest shore of the lake; see map above). Read Mark 6:53-56. Even though these events occurred over two thousand years ago, before there were telephones, email, newspapers, and texting; everyone knew what was happening around the Sea of Galilee. What happened when Jesus and his disciples arrived at the shore by Gennesaret? ANSWER 1: Once again, large crowds hurried to them, and carrying with them all manner of sick people for healing. Clearly, between the mission of the twelve and Jesus feeding the large crowd with only two fish and five loaves, the word was spreading quickly. And, in fact, those who could not cross the water by boat were hurriedly traveling around the shore line as they watched eagerly to see where Jesus would land next. ANSWER 2; Jesus allowed all of them to approach him, and he healed many, including all those whom he allowed to touch the edge of his cloak. As we close our study of Mark 6, we can observe a common theme of Jesus performing miracles that no one expected. Demonstrating his power over all of creation and the demonic world, Jesus accomplished what seemed amazing and beyond understanding to his followers. There is a real lesson here for us as well. When we are faced with trouble, challenges, tough times, and/or seemingly insurmountable obstacles—this is when our faith needs to be the strongest. We cannot allow ourselves to think that in any particular situation there is no hope. We cannot think like a human; we need to think like a person saved by the God of this universe. Matthew 19:26 states, "With man this is impossible, but with God all things are possible." So let’s live a life free from fear, as we put our complete trust and faith in Jesus to provide for our every need—no matter how challenging that need may be.